t*rexes and tiaras: shut your eyes and sing to me.. I have to admit, although I'm slowly building up a collection of their animal knitwear, and I spend a lot of time lusting over their wellies, I'd never really looked at any of the designs from the Joules duvet covers range, before being asked if I'd like to review a set. 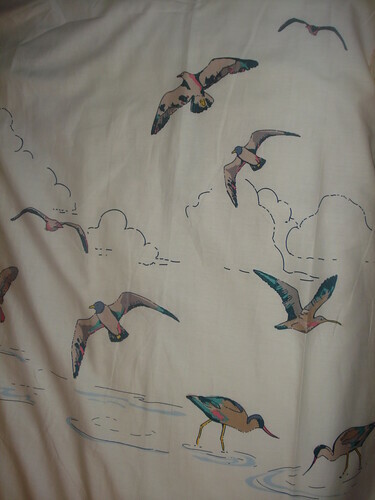 Of course, it took me a little while to choose; they have so many pretty designs - but in the end I couldn't resist the call of these seabirds, as I figured the colours would go nicely with the bed and the blanket box in my bedroom. I got it onto the bed as soon as the parcel arrived: no issues with sizing, here. The contrast between the plain background on the front of the cover, and the stripes on the underneath, seem to give it a little something extra, and I'm sure I'll use the striped side as well for a change. 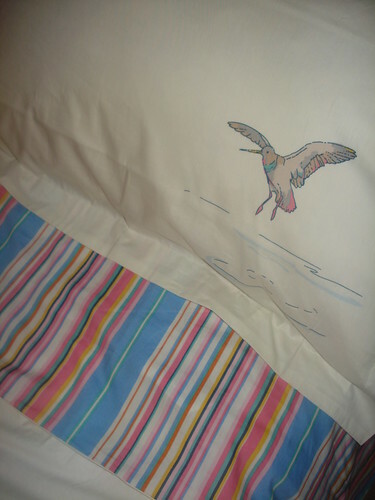 It makes it fairly easy to match the cover to your sheets, so long as you have one of the colours in the stripes. I also love how the birds seem to have all of the colours in their feathers, as well. I'm sure it won't come as a surprise to find that I'm not much of a matchy-matchy person when it comes to my bedding - I'm happy to mix and match the prints on my sheets and duvet covers, but I always think it's a bit odd when a duvet set and pillowcases are sold separately (here's the link to the pillowcases). That said, I do rather like the effect of the photo on the website where all of the pillowcases are mixed to contrast with the cover. I'd read a review on the site where the commenter said the base colour of the pillowcases and the duvet cover didn't match, but I don't find this to be the case, at all. All I need now to finish the set is this cushion..which may well be in my basket as I type this.. Nothing better than pretty bed covers to snuggle under during the winter! This is such a pretty print and I love the stripes on the back! Love reversible covers, and this is really pretty. T & I are desperate for new bedding at the moment, since the rest of our room is finally looking decent, and our bedding is falling apart. I just can't find what I want at a decent price. So frustrating. I had no idea they even did bedding. 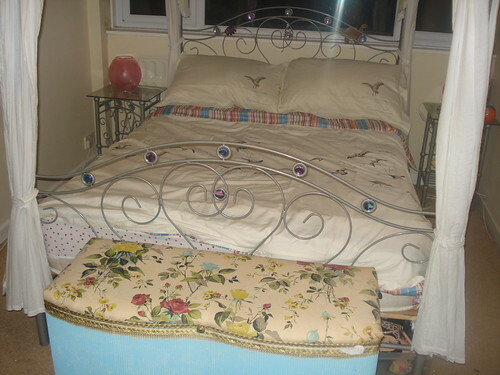 Love the ones you've chosen, it always takes me ages to find bedding I like. Oh wow, I love this! I used to work in a store that stocked A LOT of Joules (I dealt with their kids range for years), but I didn't know that they'd started selling bedding! This duvet set is absolutely gorgeous. I could do with some new sets... tempted!